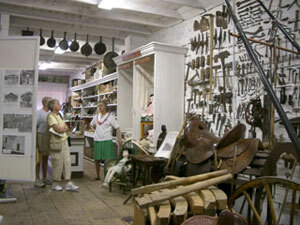 The Pioneer Store was built by Mr. James Dalglish in 1880. He had come to the southwest from eastern Canada to improve his failing health. He built the large, log building of hand-hewn Ponderosa Pine logs harvested from the mountain forests to the west of present day Chloride. 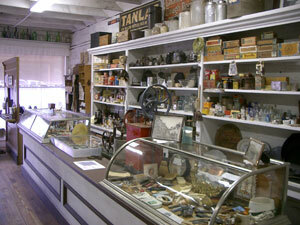 By late 1880, the building was completed and The Pioneer Store opened for business. Mr. Dalglish operated it throughout the Silver Boom years of 1880 through 1897, carrying all the goods needed for the miners and their families. The store stocked all manner of household goods, including food for residents and their animals, clothes for the entire family, mining equipment and tools, and ranch equipment and supplies. 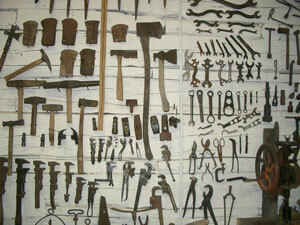 Wagons, buggies, and other large items could be ordered, as well as such specialty items as brides' trousseaus. A United States Post Office was established in the front part of the store building in 1881, and a newspaper, The Black Range, began publishing weekly from the upstairs rooms in 1882. The large safe in the store building served as a local Bank for the remote mining operators and for the scattered ranches. It also served as a ‘Pawn Shop’, as records show “--- $2.00 loaned on watch in the safe." When the Silver Boom ended in 1896, Mr. Dalglish leased the building to others who continued its operation until 1908. At that time, the building and its contents were purchased by the U.S. Treasury Mining Company. That company soon became the property of the James Family, who had arrived in Chloride in 1882. The James’ operated the store as a commissary for the employees of their mining, timbering, and ranching operations, but by 1923, most of the residents of Chloride had moved on, and the James' businesses had fallen on hard times. The family decided to close the store, and sealed it up with lumber and tin over the doors and windows. All of the original furnishings for the store and the Post Office, along with all of the items of merchandise, including food, were left in the building. The intent was that by the time the James’ young son, Edward Jr., got an education, the town of Chloride would have a resurgence, and he would have a business to step into. It did not work out that way. Edward Jr. was educated as a Scientist. His work back east, then at Los Alamos, and finally at Livermore Labs in California, kept him from returning to Chloride except for an occasional visit. When we met Mr. James on one of his visits to Chloride in 1979, we found that we had several things in common. In addition to our both being involved in developing Missile Systems for the U.S. Government, we both had a strong interest in preserving what was left of a once bustling, but now almost deserted, Silver Mining boom town. Mr. James showed us the old Pioneer Store building, and in spite of the fact that it had been closed for 68 years, and was full of bat and rodent debris, it was an obvious treasure trove of the past. We both agreed it should be a Museum, but he lived in California, and we lived in Las Cruces, and had only weekends to spend in Chloride, so there was no one to do the restoration work that was needed. I retired in 1986 and we moved to Chloride to live, and we again discussed the Museum project with Mr. James. In 1989, he agreed to sell us both the Pioneer Store and the adjacent Monte Cristo Saloon, including the contents of both buildings. We immediately began working on an application to have both buildings placed on the New Mexico State Register of Cultural Properties. Both the Pioneer Store and the Monte Cristo Saloon buildings were accepted to that list on March 22, 1991, being numbers SR1538 and SR1539 respectively. The restoration and refurbishment of the Pioneer Store building began in 1994, and was completed four years later. The exterior had to be straightened from years of sagging; the ponderosa pine logs had to be re-chinked; most of the window frames had to be rebuilt and reglazed; and both the roof and the foundation had to be redone. In the interior, we found that most of the town records from 1880 to 1923 had been stored in the building in boxes that had been stacked high. Over the years, the boxes had weakened and toppled over, spilling the contents over nearly the entire length of the building. Before work could start on the inside, all of these records had to be picked up, cleaned, and repacked to await time to sort and classify them properly. The building contained approximately 50 boxes of personal, business, and town site records. Because of the extensive bat and rodent debris, all of the store furnishings and items that had once been the store’s inventory had to be taken out, cleaned and refurbished. Once the interior was cleaned and re-white washed, the furnishings were reinstalled as they had been, and the store’s inventory was replaced on the shelves. 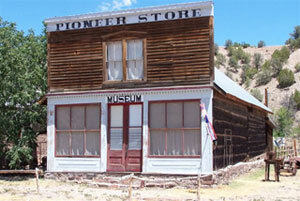 Finally, in 1998, the building was ready to be opened to the public as the PIONEER STORE MUSEUM. It was soon discovered by tourists who told fellow travelers about it. It was eventually written up in several publications including New Mexico Magazine, Western and Eastern Treasures Magazine, Sunset Magazine, Highways Magazine, and The Smithsonian Magazine. It has also been written about in several large circulation newspapers such as The Denver Post and the El Paso Times. In 1991, the PIONEER STORE MUSEUM was incorporated as a Non-Profit Corporation, and has an IRS tax classification as a 501( c )(3). The Museum does not charge an admittance fee, but rather depends on donations from visitors who want to be a part of saving some of the past.